Strongylodon Macrobotrys, also known as Jade Vine or Emerald Vine, is a perennial and evergreen vine from tropical forests of the Philippines. Known for its unusual flowers, a blooming Jade Vine makes a spectacular show of green and blue flowers hanging in long stalks. Flowering stalks are 5 feet in length or more and each covered by about 100 flowers. A mature Jade Vine would have bright green and soft leaves covering the woody stem. In it native rainforest, Jade Vine can grow as long as 75 feet, however, in cultivation it is pruned and trained to cover arches or grown over a pergola or display cascading stalks of it unusual flowers. Jade Vine blooms in spring and summer to attract birds. Fallen blooms change colors from emerald to blue-green and the purple as they dry out. Being a native of rainforests, Jade Vine grows in humid and temperate zones where temperature does not fall below 15 °C. It does not tolerate frost. Grow Jade Vine is moist, fertilized and slightly acidic soil for perfect coloration of flowers; water regularly and provide it with plenty of sunshine. Jade Vine can be grown from cuttings as well as seeds. 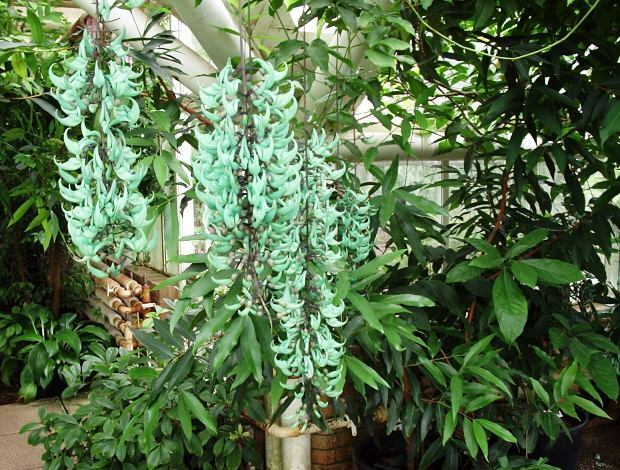 In colder climates, Jade Vine can be grown in a greenhouse with adequate level of humidity and temperature. For pollination and seeds to produce, grow two vines side by side.